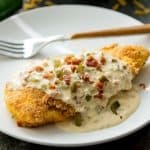 Cornbread Crusted Chicken with Bacon Jalapeno Popper Sauce is an easy to make dinner that's packed with flavor and is sure to become your new favorite meal! In a skillet, fry the bacon over medium heat until crisp. Remove to a paper towel-lined plate to drain, and then chop the bacon once cool enough to touch. Set the skillet aside and save the bacon grease for making the sauce. In a bowl, combine cornmeal, chili powder, cumin, and salt. Dip each chicken breast in the beaten egg, then coat with the cornmeal mixture. Add vegetable oil to a large skillet over medium-high heat. Fry the chicken breasts until crispy and the juices run clear. Remove to a paper towel-lined plate. Add garlic and cook and stir for about 30 seconds until fragrant. Stir in the chicken broth to deglaze the pan and then bring to a boil. Add the cream cheese and cook and stir until melted and smooth. Top the chicken with the sauce. Serve and enjoy.